what is gonna be the rating for that 3000+ ? 2200. It was 2350 in S6, but in S7 they are bringing it back down to 2200 to compensate for the fact that 2v2 will no longer count for PR. Will it come any PvE versions of all the new PvP weapons in patch 3.2, if it is where will they drop, new raids maybe. Has some one notice how much the head thing on the axe looks like the head of Mr. T and the night elf that he "created" for the comercial of WoW. So this axe is imbued by the power of Mr.T i think its one of the strongest weps of all for that reason! If blizz make one with the head of Chuck Noris it will be banned very fast and will be even more sronger then The Ash Bringer! So fear the power of Mr.T and Chuck Noris! Yeah, it looks kinda like Arcanite Reaper 2.0. It is just a retooled Arcanite Reaper http://www.wowhead.com/?item=12784 . The Arcanite Reaper was the weapon to have for a Warrior Pre-Molten Core / Pre-Black Wing Layer and before the Burning Crusade. Equip: Increases attack power by 183. Equip: Increases your armor penetration rating by 86 (6.98% @ L80). Finally, armor and weaponwise people have alot to look forward to this season. Looks like the Arcanite Reaper went to hell and back. Ninja looter -- You are not prepared! High Warlord's Battle Axe 2.0 Hooooooooooo! 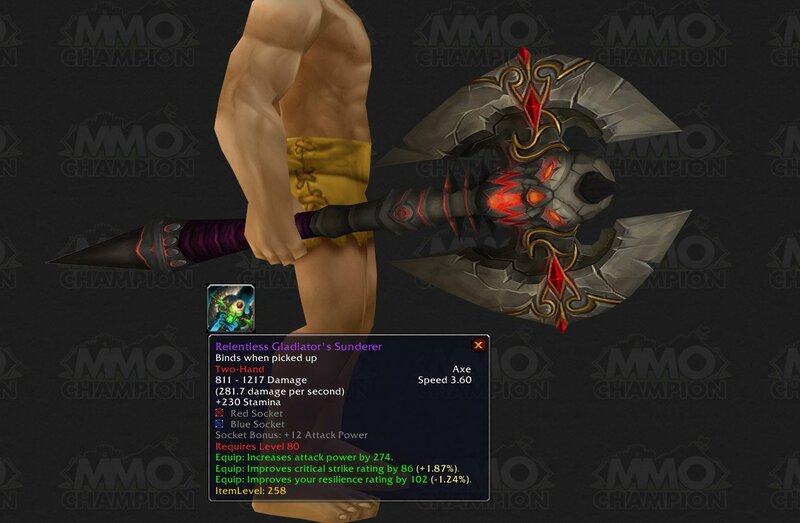 Since this axe's design is a homage to the Arcanite Reaper, it would've been quite nice if they hade named it "Relentless Gladiator's Reaper" too. So that we could at least partially relive the glory days, other than with the heirloom Arcanite Reaper, which isn't that glorious at all when you reach lvl 80... Other than the nostalgic looks. I'd say DUAL WIELD this beast. Would you want a crazy slow weapon that could break someones bones, or do you want a weapon that can literally slice through bones in a single swing? Really...this isn't very good actually. The feral druid staff does same DPS. Same stam, better attack power for druids because of druid forms. But it's too bad that weapon damage is basically useless for druids. now we can have staff wielding hunters :P until Catalysm comes out that is. Any one weapon that's 58 iLvls over another weapon is gonna pwn it in pretty much every way. But you don't see me goin' around posting random comparisons and being surprised by the results, now do ya? Hmm? ;3 jk. Really though, considering the difficulty of acquiring those weapons, the RGD deserves to pwn the CSR.